Col. Larry Cornwell (USAF, Ret.) spoke to the fifth graders on behalf of the Sons of the American Revolution. His program was on what it was like to be a Revolutionary War soldier, specifically Gen. George Washington. Cornwell wore period dress and brought the actual instruments and weapons that were used by the colonists as they fought the British during the 1770s and 1780s. Cornwell also quizzed the students on various names, dates, and historical events. 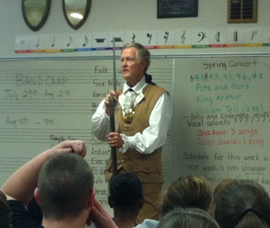 Mr. Shane Scroggins also visited the fifth graders, but he was in his Civil War uniform. Scroggins brought gear and supplies to show and demonstrate for the students, but also had real Confederate uniforms for the students to try on. Scroggins believes in historical recreations, and in "bringing the past back to life," as stated in his brochure. Fifth graders study the American Revolution near the end of fifth grade. Students study the Civil War and its aftermath at the beginning of sixth grade. Both of these programs were informative and educational, and enjoyed by the students.